In the tabs below, you will find links to suggested course outlines, downloadable diagrams and checklists, and printed PARTHENOS materials that may help you in your training or teaching objectives. PARTHENOS Project Training Materials have been used in a number of ways: here are a few examples. 1. 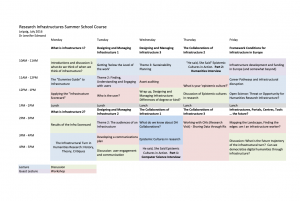 Week-long summer school focussing specifically on research infrastructures. 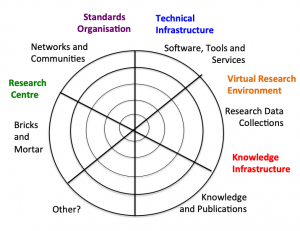 This file gives selection of 7 different definitions of research infrastructure, taken from different perspectives (US/Europe, Cultural Studies, Policy, Information Science etc.). It also gives a ‘quiz sheet” and answer key to promote discussion. 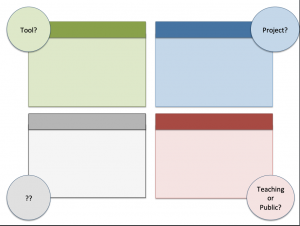 This exercise is intended to help develop thinking about the kinds of roles research infrastructure plays in our work, and how, depending on its goals, a research infrastructure may show different characteristics. By depicting your estimation of the level of emphasis an infrastructural development places on the development of different kinds of assets and profiles, you can begin to develop an appreciation both for that particular development and its implicit mission and value as well as for the full variety of interventions currently contributing to the infrastructural landscape. This tool can be used with the list “But are they Infrastructures?” or to look at your own organisation as a support for strategic development. This is a non-exhaustive list of project names and URLs to promote comparison of how different projects may (or may not) reach infrastructural scale, and what models exist in this wide field. 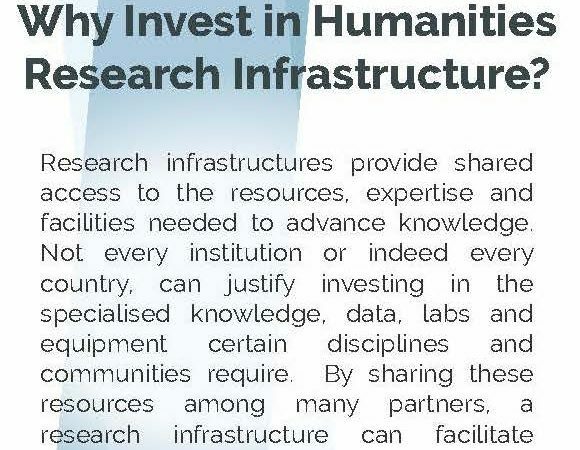 Given the inclusiveness of most definitions of research infrastructure, it can sometimes become difficult to talk about what an infrastructure isn’t! This tool looks at infrastructure as having three essential characteristics: scale, openness and a focus on research. It is intended as a pathway by which to structure an analysis of digital humanities projects, but also to look at one’s own work, guiding understanding of when an ambition may be infrastructural in scale, what considerations may be required to achieve such an ambition, and what alternatives one may have. This brief guide is intended to give a very high level overview of the role research infrastructures play in the research ecosystem. Although intended for the ‘Executive Level,’ it can be a useful piece for getting key messages across to any novice audience. 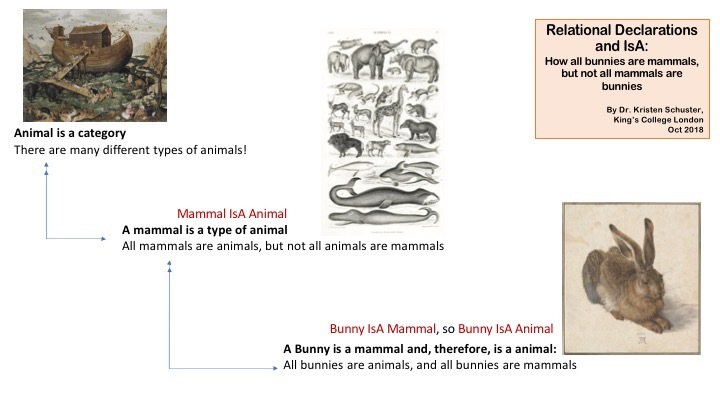 This diagram was developed by Dr. Kristen Schuster at King’s College London, and demonstrates how relations can be defined between items in order to establish a hierarchy. This information can then be used in a knowledge representation system, such as a taxonomy, or a formal ontology. 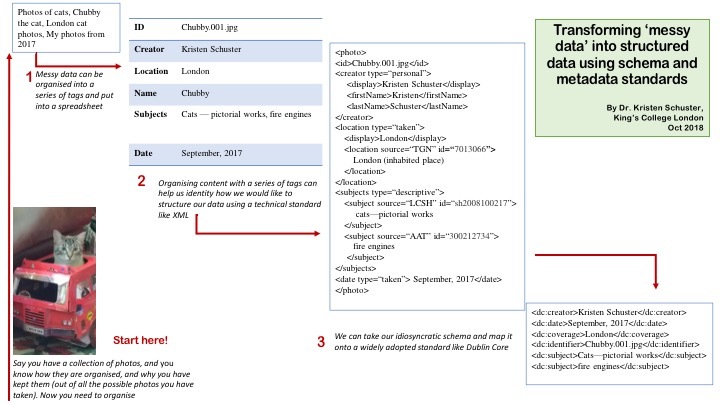 Diagram showing how ‘messy’ data such as a collection of photographs can be structured using schema in order to make them more searchable, or integrated into a formal ontology.